We've all encountered it while driving to work in the morning, if traveling west to east. The bright Colorado sun peeks up over the horizon, it's beautiful...but it's also blinding. Many accidents, involving car or bicycles, have happened due to the glare of the sun. If you enlarge the above photo, you WILL see a bicyclist, although at 35 miles per hour, talking on your cellphone, and taking a sip of your morning coffee, you most likely wouldn't see them. 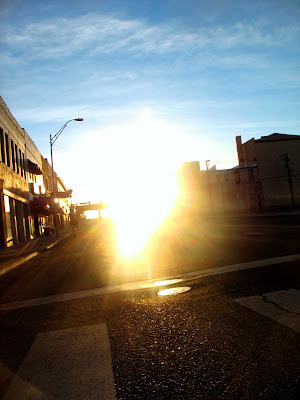 So when the sun is glaring in your eyes, slow down, concentrate, and be careful.